Fast, healthy and extremely flavorful! Close your eyes with your first bite and you’ll be transported to central Asia when indulging in a bowl of this soup – and that’s not a bad thing in the middle of winter! You really don’t want to skip the toasted coconut at the end. 1/4 Cup Curry Powder – it seems like a lot and there are several different kinds of curry powder – you can start out with 2 Tbsp and add more later without hurting anything. John’s not much for vegetarian dishes so I add some diced chicken meat here or I cook it in a separate pan and add chicken to just his bowl. Toasted Coconut – just saute a handful of coconut on the stove top in a dry frying pan – stir until it’s lightly toasted. This soup sounds so GOODDDDDDDDDDDDDDDDD, I am going to make it here in Roatan real soon. Thank you and WELCOME Caroline! Sounds really delicious. Your list of ingredients just kept getting better as I read on. Can’t wait to try this. 10 days of soup — I’m in. Can’t wait to see what’s next. Curry and lentils. of course it’s good. As scrumptious as it looks and perfect for my weather. This soup sounds wonderful. Enough curry to make a statement! this pic is a thing of beauty… and its not even cake! Hi Mary! Lovely weather we’re having, huh? 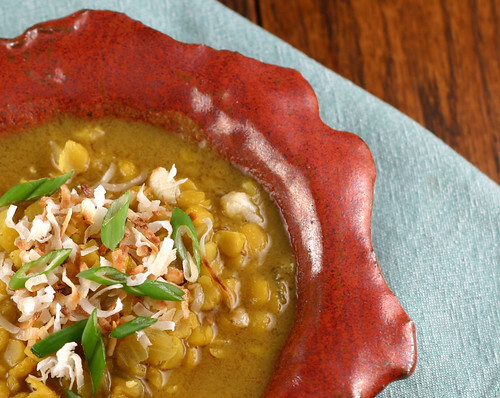 It’s a great excuse to make this soup. I love curried lentil anything. Beautiful picture.